How can one experience a “birth” and a “death” at the same time? I have experienced that paradox up close and personal two times. The first was our twin pregnancy that ended on September 5, 1990, in the hospital delivery room, when our (now beautiful 24 year old daughter) Lindsay, was delivered with a sad and pitiful little cry, just minutes before her identical twin sister, Gretchen, was exhumed silent and still from her mother’s womb. Gretchen had succumbed to the complications of the rare twin–to–twin transfusion, a condition that had us on pins and needles for the final 11 weeks of the pregnancy. The doctor had said in the very beginning, after the diagnosis, there was only a remote possibility of having any babies. After Lindsay’s delivery the collatoral effects of the condition kept her in a neonatal intensive care unit for 25 days before we would bring her home from the hospital. Of an unfairly long list of personal tragedies and challenges, this was by far my deepest sorrow and my darkest day. Every birthday that Lindsay has celebrated since that day – and, in fact, every act of celebration of a life event: first steps, learning to ride a bicycle, going to prom, graduation, and most recently walking her down the aisle to get married – all have been sweet and bitter for me. Not a single one of those milestones have I celebrated with Lindsay without wondering: “what if?” in remembering my sweet, tiny, and perfectly formed Gretchen. It had not even been five years since that hard day when we were back at the hospital for the delivery of our third child. The pregnancy had gone fine this time and we were thankful that other than routine doctor visits Leann nor I worried about much, other than normal “expectant parent” concerns during our nine month wait. In the late morning of January 12, 1995, after finding out we had a brand-new baby boy, I couldn’t imagine I was about to experience that ever so strange encounter with a birth and a death at the same time yet again. Leann and I never knew the gender of our third child during the pregnancy. So as soon as I heard the doctor proclaim: “it’s a boy,” I let my mind run free with all the things any father has in mind when thinking about a relationship with his son. How often is it recounted by someone who has a brush with death and escapes, “I saw my life pass before my eyes?” I have never thought about the truth of that in all these years until this very writing. That is exactly what happened to me. 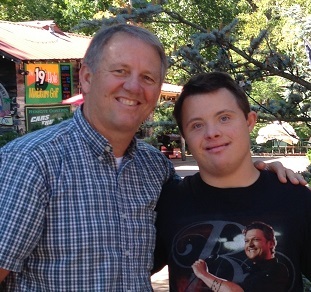 I saw my life with my son played out in living color in the hour or so between hearing, “It’s a boy,” and hearing, “Well, we can’t really confirm without genetic testing…but he does appear to have traits that are characteristic of Down syndrome.” As quickly as I had painted those pictures in my mind of days that we might spend together sharing a love of sailing, throwing a ball, flying airplanes, looking for beauty in the world, singing songs and making music – there was an ugly crashing sound as those dreams were all pronounced “dead at the scene,” by the nurse who was the only one brave enough to tell us the truth when we began to realize all really wasn’t right with the world anymore. I have been led to a deep and beautiful truth myself as I have contemplated Matt’s birthday on January 12. I am sure I have felt this way for some time. I am also sure I have never had the words to articulate my feelings like I have been given now as I remember this important 20th birthday that we will celebrate with our special son, Matt. What has “appeared” or been made manifest to me, is that whatever sadness, sorrow, mourning, or grief I experienced at the birth of my son and the death of my dreams, has ever so surely and completely been replaced by the undeserved abundance of love and laughter and joy that Matt has given us over the 20 years we have been blessed to have him in our lives. I love God. Honestly, I do. Sometimes I have to remember that Jesus’ commandment to “love God,” uses the same Greek word for love that we pastors explain to brides and grooms: “this love (agape) means you choose to love even when the object of love doesn’t seem very lovable.” So sometimes (especially September 5, 1990, and January 12, 1995) I have simply chosen to love God even when I really didn’t want to. You see, what I would discover along the path of what I thought would be a dreadful journey, was the surprise that Matt poured overflowing love into my life, and like someone using a funnel discovering it can only empty out at the same rate something is poured into the top, I soon realized this sweet boy (who would be furious if he knew I called him that, now that he has “turned from a kid into a guy!” – his own insistent words) started filling my wounded heart so fast and so full with love and joy that what went out of the hole would always be overcome and overfilled by his special love. I get it now. Thank you. Thank you! Amen.